We are eager to partner with faculty members to help design course assignments, develop research guides and facilitate workshops. The Mulva Library team is committed to actively supporting research and information literacy instruction for the entire St. Norbert College community. As partners in teaching, we focus our efforts on collaborative discussions about student learning and encourage exploration and reflection during the entire academic journey – not just one-time assignments. Contact Kristin Vogel to start a conversation today about ways to incorporate information literacy into your course or program. 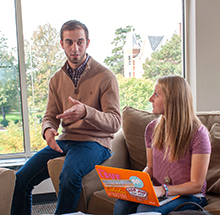 Work with us to customize a session for your course or for other programs like study abroad, Honors and more. Work with our librarians on course and assignment design and introduce your students to the research process, information literacy skills and more while they learn course content. We also help with student learning evaluations and scaffolding – integrating information literacy practices into course materials. Collaborate with us to create videos, tutorials, handouts and more. We also assist with digital content for Moodle, Google Classroom or other learning platforms. Prepare your students for academic-level research with College Jumpstart workshops that focus on strategies that aid in the discovery and evaluation of information sources. Need to do research for a specialized project? Want to introduce your members to research and information literacy best practices? Contact Kristin Vogel to get started.